Matilda is a Hallberg Rassy 352. She was built in 1983 and she is hull number 315 out of more than 800 build in total between 1979 and 1991. The previous owner had done a good job in upgrading the boat by replacing the engine and the rig and also removing the worn out teak deck. Some people say that a Hallberg Rassy without a teak deck isn’t a real Hallberg Rassy. Well, although I like teak decks, I think that the professionally done paint work on deck looks great. It is environmentally friendly, anstislip and does not get that hot in summer. The complete rig was upgraded too with a brand new double spreader mast from Selden. The HR352 had 2 mast options during her production period. First boats were mostly equipped with a single spreader shorter mast while most of the later production boats were delivered with the taller double spreader mast (which was 1.4m taller). When the previous owner replaced the mast he decided to go somewhere in between. He ordered a mast which was 80cm longer than the short HR mast but with two pairs of spreaders. The main sail slides up and down the mast on Rutgerson MDS cars and is fully battened. 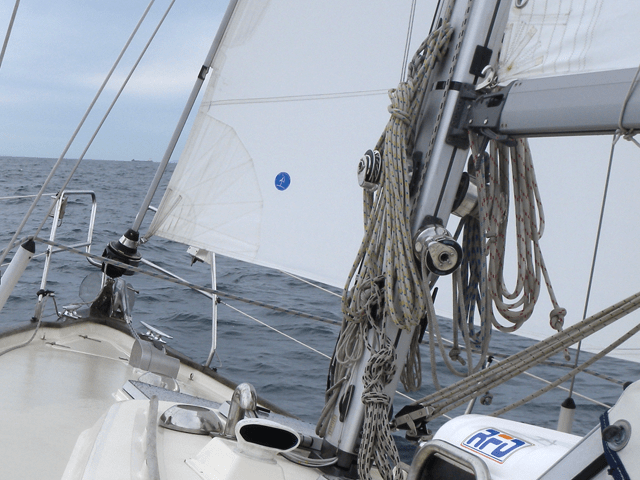 This makes hoisting and reefing (even under load) easy peasy and the full battens significantly improve sailing performance upwind. I found your beautyfull boat with the searchterm ‘hallberg rassy without teakdeck’ in google. Me and my girlfriend are in the process of buying a hallberg rassy 38 with a very bad maintained teakdeck. And I don’t like teak decks at all for this very reason. So we had quit a few doubts. But we are very enhousiast about the ship itself and so I contacted Hallberg Rassy for info on the deckconstruction and about the possibility to remove all teak and go for a coating. But mr. Rassy said that it wouldn’t look good and advised against it. But!, since I found your picture, and the result on your ship (and in fact the only one I can find!) is so goodlooking and nice that we are willing to take the risk (and the work involved) and we are going to try and buy this boat. Now I am wondering if you might know somebody who can give us some tips and tricks for this project. Perhaps you can bring me in contact with the person who treated your boat? And perhaps you can sent me some more pictures of your deck? Or you have some tips? I would really appreciate your opinion\ information. I had the same concerns as you about teak decks. I must admitt that I like them but for a HR352 it would have been about 15k for a new one. The boat you are considering buying is of similar age and a restoration does propably not make sense. Removing the teak deck and painting is a major job. This was already done when I bought the boat 2 years ago. The job was accomplished by a professional yard in Holland (Vlieger I think was the name but I will try to find out more). As you know there are about 500 screws holding the teak strips down on the deck. All these holes need sealing of course. And you have to make sure that there is no moisture in the deck structure before sealing too. I think there was also one layer of glass applied on my deck. The paint job was done using De Ijssel Double Coat. I saw two other Hallberg Rassy boats without teak decks. One 352 and one 312. Both were not as nice as mine. I will send you pictures on your email address. That’s a nice looking deck. We just bought a HR 352 with a deck that needs a refit. Maybe painting is the way to go! After removal of the teak and a drying period, screw holes were sealed. Thereafter, 2 layers of glass mat over the entire deck. Shipyard Vlieger has primed and then painted the deck. The deck is painted with anti-slip paint of De IJssel.. The technical man is Jan Huizer, a first-class professional. It sounds like a lot of work and it won’t be cheap but it will be a lot cheaper than replacing the whole teak deck. I wish you good luck with whatever you decide to do and always fair winds! I was studying the photo of the mast and the winches and have a question. I recently bought a 1982 HR 352 and have found that both the main and the genoa halyards are taken to the same side of the mast at the base, the port side. This gives me a problem as there is only one winch on that side so I am planning to move one halyard to the other side. 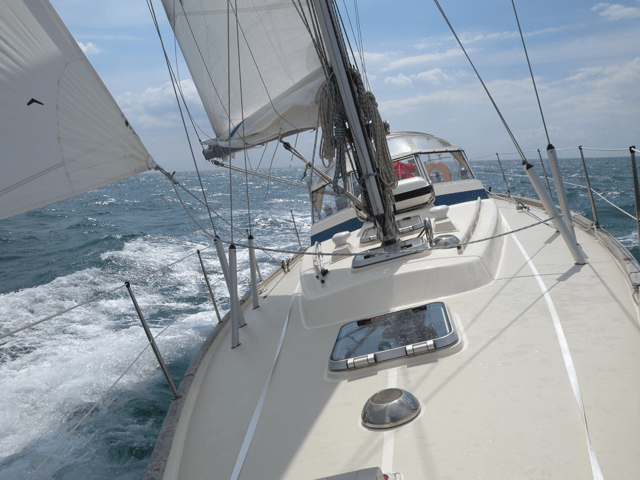 From the picture it looks like you have one halyard to each side….am I right? 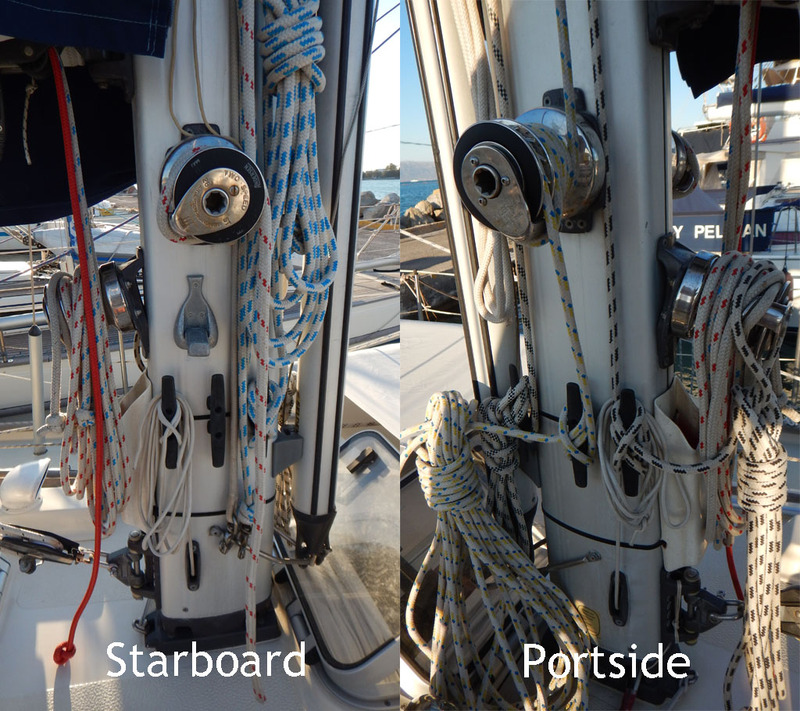 I also see that the one on the port side is secured to a cleat…do you use the winch to tension it up? and if you do, how do you manage to keep it tight while you get it on the cleat? Hello Shane and welcome to my blog! Congratulations on your new HR 352! I had a look at many before buying mine but I can’t remember one having both halyards taken to one side. I have seen wire-halyards on early production numbers and I guess that the previous owners had changed the arrangement. It will be a bit dificult to compare with mine because the complete rigging on Matilda was replaced about 8 years ago with a new one from Selden. It has three self tailing Andersen winches, one on each side and one for the reefing lines. This way, operation is quite simple. I leave my halyards (one on each side) on the winches and secure them on a cleat further down the mast. I took some close ups for you. See below. Take care and allways fair winds! Thanks Evan….I moved a halyard last week and it’s a vast improvement. I can now get and keep tension on the genoa halyard as well as the main. I think I may move / add more cleats as well, as unlike yours, they are above the winches, which is a bit awkward. Many thanks for the pictures! Fair winds to you. We are going to install an air conditioner to my friends HR 352. 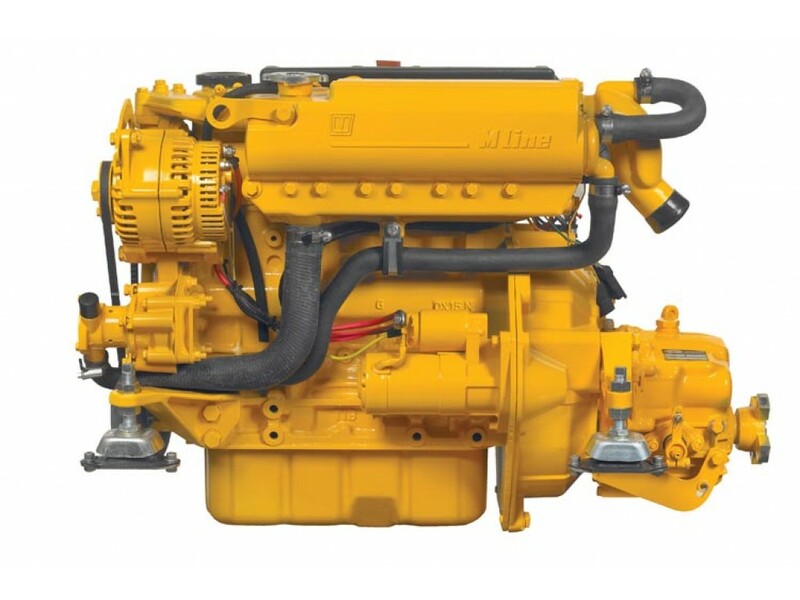 We are looking HR-352 users blogs to know the best location in the boat for air conditioner. Would you share where did you installed your air conditioner if you have? Really enjoyed your blog, I have a 352 from 1980, complete with painted deck. What type of autopilot and battery system do you have? It looks really impressive in the videos. Oğuzhan… my air conditioning sat on a shelf which was located really high up in the starboard locker, along with the fridge compressor. I removed it but am going to refit this year as I intend to bring boat back to the Med for some cruising. Autopilot is an old Raymarine ST5000 PLUS SailPilot. That is the one that has the complete electronics stuffed into the control head. Works fine except of some rebooting when it struggles to move the rudder because of heavy seas for instance which could cause current spikes. I thought the reason may be my week batteries which were about 10 years old and degrading rapidly in the last two years. After replacing them I found that there was no difference. In the video on the way back from the island of Milos, the autopilot rebooted a few times in 12 hours. 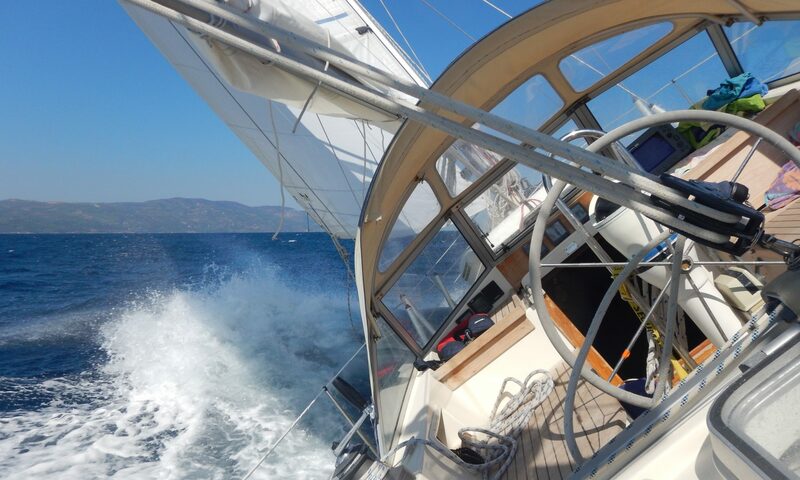 When sailing close hauled, this is not a problem though, because the boat goes slowly off course, but if you are running before the wind… I have replaced the unit with a NOS ST5000 which I had bought in the US a long time ago before I started in Holland for my journey to Greece. I tested it last week and it workd fine but the conditions were a lot nicer. So I probably have to look into that unit. The pilot controlles a linear drive which is attached to the quadrant. The battery system by the way consists of a starter battery and two domestic batteries connected in parallel. All 3 of them are Exide ER 550 DUAL Marine Battery 115Ah which are the same ones that lasted 10 years. They are connected to the alternator via a schottky diode splitter which I wanted to replace by a Sterling Power PSR122 0.0V drop alternator splitter which promises full charge because of the lower voltage drop out. I’ve see your boat without teak deck and I was very interested to see the whole work (photos). May you send me (by email or by link …) photos of that beatiful work ? Hi Adriano, I will send you some pictures. You can find more information about the deck paint job on this page. Hello Adriano. Thank you for such an interesting website. I too have a HR352 and am looking at teak deck replacement in the next few years. I’m very interested in any more information and photos you can provide of your painted deck. Can you send me an email with that? Thanks very much. are you trying to communicate with Adriano or with me? So sorry Capneven, my request should have been directed to you. I’m still very interested in any details you can give me about the deck work.